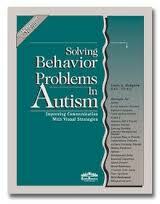 Solving Behavior Problems in Autism: Improving Communication with Visual Strategies by Linda Hodgdon. This book provides a practical approach to recognizing the complexity of behavior management for students with autism spectrum disorders and other students with communication and behavior challenges. Continuing the approach of supporting communication with visual strategies, this book is packed with problem solving techniques. Pp. 254. This entry was posted in Behavior Modification, Our Library and tagged Autism Spectrum Disorder, behavior modification, books, Communication, visual support. Bookmark the permalink.